Our family comprises Manfred and Maria Becker, their son Mark and his wife Michaela Bäumler-Becker and their two daughters Laura and Sarah. Together, we work our wine estate, which is now around 300 years old, and look after our new apartment house and wine restaurant. Manfed took over the family wine estate in the sixties. 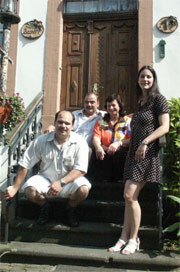 Together with his wife Maria they extended the estate to a total area of 5.5 hectars. In 1990 the next generation followed in the footsteps of their parents. Mark, youngest of the three children and the only son, began his training as vintner, which he completed successfully in three years. A further course in management laid the foundation for the attendance of a course leading to the qualification as "Meister", the highest qualification that a craftsman can attain in Germany, which he attended from the autumn of 2001 until he recieved his "Meister" in the summer of 2003. Our ancestors began making wine in Burgen in the 17th century and we are carrying on the tradition in the 10th generation with the same enthusiasm. 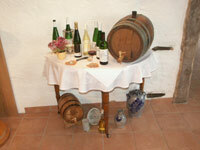 Until 1988 we combined wine-making with general agriculture. Since then we have concentrated on the production of high quality wine. In the year 2000 we diversified by converting the disused agricultural outbuildings into a 3 star studio apartment and two holiday flats which have also been awarded 3 stars.